The British seem to have had a long fascination with hybrid operatic dramas. Weber's Oberon (commissioned for Covent Garden in 1826) has a lot in common with Purcell's semi-operas, the same unwieldy combination of operatic scenes and spoken dialogue, the large number of spoken roles and the dependence on grand scenic effects. Weber really only took the commission because he was concerned to earn some money for his family, knowing that he was dying. But he did hope that he would be able to re-work the music into a coherent piece once he returned home. He never did return, Weber died in London on 5 June 1826. The work has retained a toe-hold on the repertoire, thanks to the superb music, but more frequently in concert than staged. Our visit to see New Sussex Opera's staging of Weber's Oberon at the Devonshire Park Theatre in Eastbourne on 23 November 2014 was only the 3rd time I have seen the work staged in 40 years of opera going. It was directed by Harry Fehr, with Adam Tunnicliffe as Oberon, Sian Griffiths as Puck, Adrian Dwyer as Sir Huon, Sally Silver as Reiza, Carolyn Dobbin as Fatima, Damian Thantrey as Sherasmin, the New Sussex Opera Chorus and St Paul's Sinfonia conducted by Nicholas Jenkins. One of the delights, and difficulties, of performing Oberon is the discovery that many of the virtuoso instrumental lines in the overture are in fact taken from vocal lines of the arias in the opera. Though the plot might be pointless and have too much spoken dialogue, the arias all require singers of great stature. One cannot help think that director Harry Fehr was either brave, or foolish, to accept the commission to direct at staging of Oberon with a semi-professional company (the chorus are amateur and the administration largely voluntary), on a very low budget with a young cast none of whom will have sung their roles before. 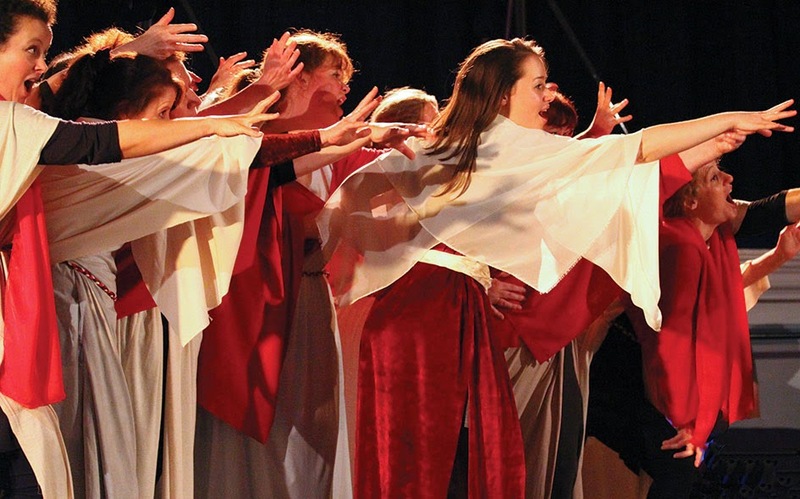 But New Sussex Opera has a history of successfully staging difficult and rare opera, their much that was regarded as unperformable such as Berlioz's Benvenuto Cellini and Offenbach's Die Rheinnixen. The beauty of Fehr's staging was that he took the opera seriously. He did not poke fun at the story, but instead stripped it back to basics. There was no set, just a pile of chairs round the sleeping Oberon which the fairies placed round the stage and sat on. Costumes were simple, the fairies in muted plain colours, the humans in roughly 20th century dress (Huon and Sherasmin in battle fatigues, Reiza and Fatima in the long dresses and scarves that well born young women from 20th century Bagdad would have worn). The fairies were present all the time, and watched the action. This was extended by the fact that we watched them dress up as the various characters in the plot. Adam Tunnicliffe and Sian Griffiths as Oberon and Puck, took the leading spoken roles in each of the scenes which made economic sense and created a dramatic unity. Fehr did not push things, so that he never overstated the idea of the fairies creating the entire story but just left us to work it out for ourselves. Similarly, he did not over-work the striking modern parallels of a soldier going to Bagdhad and coming back with a clearly Muslim wife! Various people have had a go at solving the Oberon problem over the years, adding more music from Weber's other operas but none of these versions has really taken. Some productions that I have seen have replaced all the spoken dialogue by narration. Fehr's rather neat solution was to have the purely spoken scenes done as narration, spoken by members of the chorus, but the scenes with music kept their spoken dialogue. JR Planche's libretto is weak, but as John Eliot Gardiner has demonstrated in performance, it is not anywhere near as awful as comentators like to make out; there are plenty of other operatic librettos nearly as bad. Though the fact the Planche provided the librettos for the Covent Garden pantomimes rather does show at times! Oberon needs two tenor parts, both capable of singing Weber's passagework but yet also capable of being on the dramatic side of lyric. I confess that I have heard performances (with well known casts) where the Huon has clearly not been able to cope with the part. 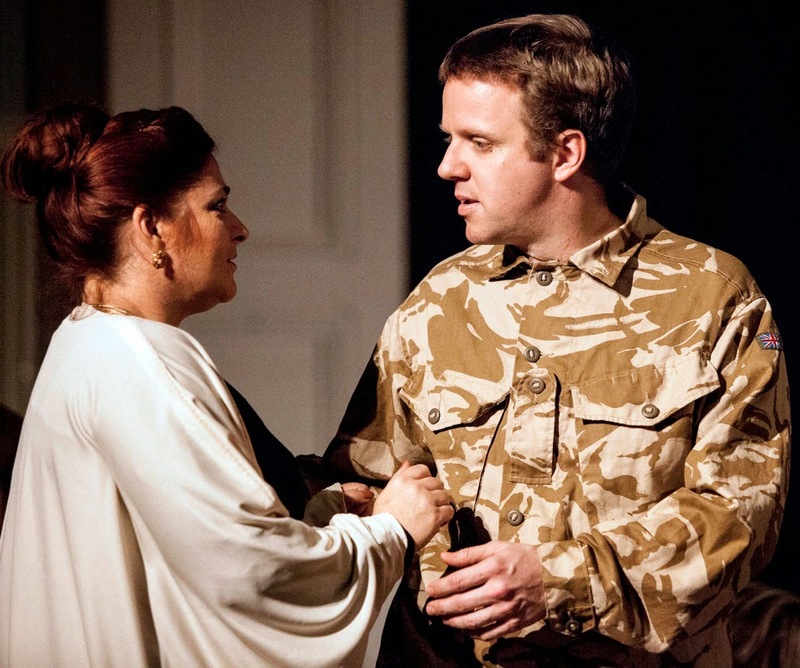 So New Sussex Opera struck gold with Adam Tunniclife and Adrian Dwyer. Dwyer made a very personable Huon, beliveably understated and bewildered by the events going on around him. He coped admirably with Huon's vocal line, producing cascades of nicely even passagework. I have to admit that sometimes his tone was not ideally relaxed, but in the context of such a taxing part this is a small point. Tunniclife made an admirable Oberon, singing with firmly resolute tone and displaying not the slightest hint of camp send-up (thank goodness). Tunniclife made his various transformations into the Caliph of Bagdhad or the Emir of Tunis entirely belivable. 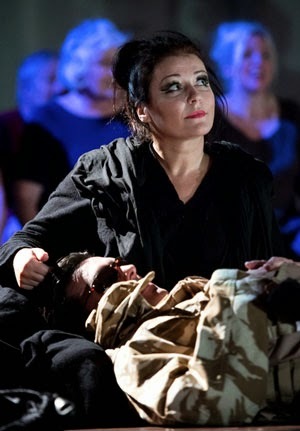 But though the two tenor roles are important, the central role remains that of the soprano heroine, Reiza. It is she who gets the opera's biggest and most well known number, the scena Ocean thou mighty monster which was frequently recorded by sopranos (there is even a studio recording in English by Callas). Sally Silver was in fine voice as Reiza combining vocal virtuosity with the flashes of jugend-dramatisch needed. Whilst her performance of Ocean thou mighty monster was compelling, the rest of her performance was on an equal level. The remaining roles were equally finely sung. Carolyn Dobbin was a complete delight as Fatima. Her solo numbers sung with an appealing charm and warm mezzo-soprano voice, and her spoken dialogue given with a nice twinkle in her eye. Sian Griffiths (who is still studying) made a sympathetic and fluent Puck, and formed a nice double act with Tunnicliffe. Damian Thantrey was obviously having great fun as the comic servant, Sherasmin. The character has very little music, but what there was Thantrey sang with the care and attention it deserved. Five smaller roles of fairies were sung by members of the chorus, Nisha McIntyre-Burnie, Beatrice Monaco, Michael Diamini, Rachel Farago and Rachel Shouksmith. The hard-working chorus was on-stage for the whole opera and really formed the core of the drama. It was they who created the ship-wreck and other dramatic scenes where Weber's orchestral interludes would have been originally accompanied by visual effects. And there was dancing too, and a glorious scene in the Emir of Tunis's harem where the varied ladies of the chorus threw themselves onto Adrian Dwyer's bewildered Huon with a nice abandon. Clearly director Harry Fehr had been able to work well with the chorus. The whole was conducted with admirable sympathy by the artistic director of New Sussex Opera, Nicholas Jenkins. He was skilled at ensuring that pit and stage remained in synch (which can sometimes be a problem in complex stagings using non-professional choruses), as well as being a sympathetic accompanist in Weber's more complex vocal numbers. Weber's lovely orchestration perhaps needs a bigger band than would really fit into the pit at the Devonshire Park Theatre. The St Paul's Sinfonia numbered just 25 players, and even then the horns, trumpets and timpani were in the stage boxes. But the few strings made an admirably firm sound which though lacking the surface gloss of a larger group, had a nice vitality too it. And the reduced forces did at least enable the balance off Weber's music to work, without the modern orchestra's tendency for the strings to overwhelm the woodwind. (Weber is a composer whose music responds to the period instrument ensemble). We went along curious and interested to hear Weber's Oberon on stage again, but came away delighted and entranced. New Sussex Opera, Nicholas Jenkins and Harry Fehr and their cast captured something of the charm of Weber's opera and the very naivety of the staging had a delight all of its own. The production is at London's Cadogan Hall tomorrow night, Tuesday 25 November 2014. I thoroughly agree. Felt privileged to see yet another rarely performed opera, thanks to the commitment and ingenuity of the NSO.